A delayed morning post is coming your way today thanks to our internet. It has been acting super funky lately and the signal keeps going in and out. It’s pretty great. Today’s workout began with 25 minutes on the elliptical. I spent some time flipping through Fitness Magazine while listening to music and enjoyed a less-intense cardio session. Once I was done, I jotted down a quick circuit workout to complete on the gym floor. I completed three mini circuits that included two exercises each for a total of six exercises. I did six reps of each exercise and went through each mini circuit six times. It was sweatastic! 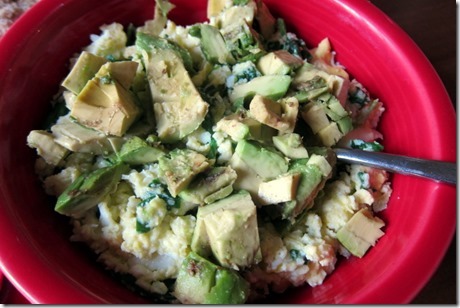 After my time at the gym, I headed home and prepared a batch of scrambled eggs with mozzarella cheese, spinach and avocado. Served with a whole wheat English muffin! 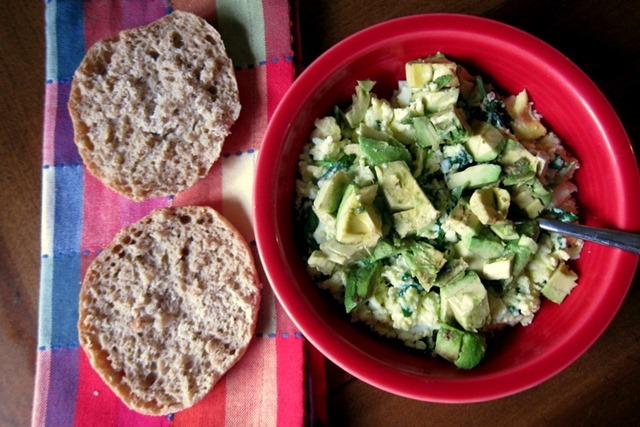 What is the best new recipe you’ve tried lately? I’ve been feeling a little bored in the kitchen lately and am looking for some recipe inspiration! Please share your latest new recipe success! 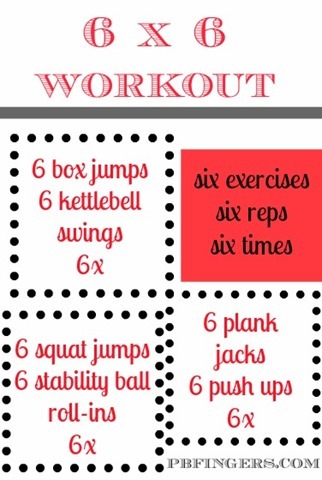 Looks like an awesome workout! 🙂 Just wondering when you have time ( I know you are really busy with your new job!) if you could update your daily workout page… Sometimes I forget to write down/pin your workouts and it’s an easy way for me to go back and check! 🙂 Thanks again for all the great sweaty workouts. Here are two recipes I made this week for dinner & loved! I also just tried cauliflower rice for the first time and now love it too. Love that workout! I might actually switch my plan for tomorrow morning to include this instead! Thanks for sharing! Hello – Long time reader first time commenter. I love your web-site. I look forward to reading it each day. The other night for dinner I made a spaghetti squash (I bake mine) While it was baking, I grilled some chicken on the grill outside. I sauteed some garlic and onions together with some fresh cherry tomatoes. At the very end I added a bit of Feta Cheese. Once the Squash was done, I added it to a bowl, mixed in the tomato mixture, and topped with chicken. It was delcicious and nutritious! I LOVED your BBQ turkey meatloaf! I’m not even a fan of meat, but that was delicious, and so easy! I might have to make it again next week. Thanks for the recipe! I just tried a recipe from Women’s Health Mag: Sweet + Spicy Quinoa Hash. (sweet potato, kale, quinoa and some spices!) Super easy and really delicious!! Hey Julie-I absolutely love, love , love skinnytaste.com for recipes. They are all healthy and delicious. You should check it out!!! My favorite new recipe is the Fitnessista’s Breakfast Cookie Dough Cereal. I love oats, but the traditional and overnight versions can get a bit boring. This is a fun way to mix it up. Here’s the link to the recipe: http://fitnessista.com/2010/08/serious-cereal/. I’d personally argue regarding the majority of folks that has to be an incredible exercise routine. I uncertainty an average are capable of doing 25 mere seconds of constant pushups, stay ups, or perhaps leaping jacks with a quality speed.